DID is short for Direct Inward Calling. A call can go directly to a phone from inside the FreeSentral, by defining the destination as a DID. The destination can be an extension, a group of extensions, a voicemail, etc. Go to the menu DIDs. Press the edit button associated with the DID you want to edit. When pressing Destination, you will choose the routing destination for the number typed in the DID field, above the Destination. 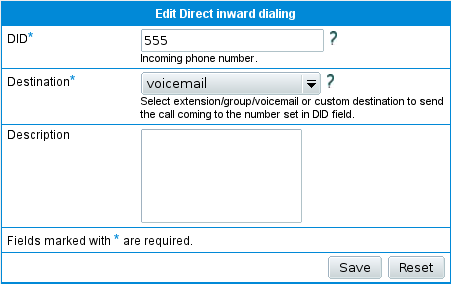 You can select an extension, a group, voicemail or a custom destination. Press the delete button associated with the DID you want to delete. The admin can define conference rooms that are always active. To define such room he needs to set a name and a number that will be used to dial inside the conference. The admin can monitor the number of participants to each room. Go to the menu Conferences that is inside the DIDs section. Press the Add conference button. Press the Edit button near the conference room you wish to edit. Set the name of the conference room and associated number. Press the delete button associated with the conference you want to delete.